This study aims to test the hypothesis that trees at high latitudes produce wood with better basic properties than trees at lower latitudes. 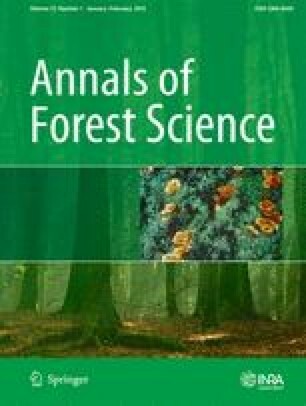 Growth and wood characteristics were assessed according to cambial age in 25 black spruce (Picea mariana) trees from five sites located along an alti-latitudinal gradient in Quebec. Sites at higher latitudes and altitudes exhibited slower growth rates and lower stem volume. Wood density and mechanical properties were higher in the sites located at lower latitudes or altitudes. Fiber size had higher values in southern sites, but only at younger ages. Principal component analysis confirmed these results, with the northernmost site being the one where growth, density and mechanical properties were generally lowest. The reduction in growth was not compensated by increases in the basic properties of wood. More extensive samplings are needed to validate the results at larger scale. Northern stands are expected to produce wood of higher quality, making these areas attractive for the forest industry. This hypothesis was not accepted by the analysis. Thus, the reduction in growth would not be compensated by increases in basic properties of wood. The online version of this article (doi: 10.1007/s13595-014-0399-8) contains supplementary material, which is available to authorized users. The authors thank J. Boulouf-Lugo, F. Espìn, J.-G. Girard and C. Soucy for technical support, and A. Garside for checking the English text. This work was funded by Consortium de Recherche sur la Forêt Boréale Commerciale, Ministère des Ressources naturelles du Québec, and Fonds de Recherche sur la Nature et les Technologies du Québec.